Here in this blog, You can get complete details of coding decoding reasoning with their definition, types, examples problems with solutions and their questions. You can easily practice of all the topics of coding-decoding reasoning one by one. So, let's start your practice by this useful blog. It is the process of converting a piece of information into another form of representation through signals. Hence, it is the process of sending a data from one person to another person in such a way that only sender and receiver can understand its meaning without any intermediately. It is the reverse process of converting the coded information back into original form understandable by a receiver. Hence, decoding is the process of converting the coded data back into original form by applying the process of coding but in reverse process. 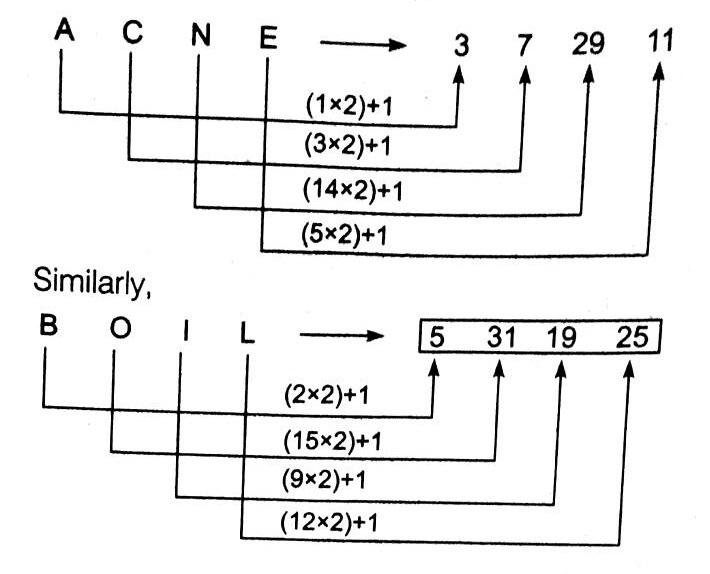 In this type of questions, a set of letters and numbers are coded in a particular way and candidates are asked to decipher the pattern and code other words or numbers in that same way. The codes are based on various patterns and principles such that the message can easily be deciphered or decoded at the other end. Here, letters or alphabets do not stand for them self but for some other letters, they have an artificial or coded value. The coding and decoding test is set up to judge the ability of candidates decipher the rule that has been used to code a particular word/message and break out the code to decipher the message. In this, we are going to deal with the types of questions, in which the letter of a word are replaced by certain other letters according to a specific pattern/rule to form a code. Candidates are required to decipher the pattern of coding to substitute the given word from the given alternative. Example.1. 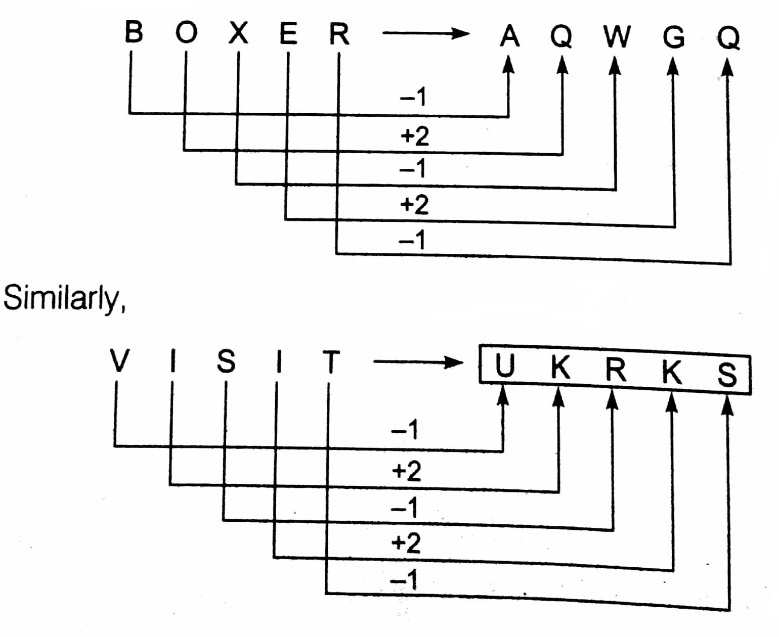 In a certain code language ‘BOXER’ is written as ‘AQWGQ’. What will be the code of ‘VISIT’ in that code language? * The pattern of codded language i.e., simple, reverse, cross and replacement. * Try to solve these questions with the help of alphabetical values. * The pattern of coding may easily be brought out in mind with the help of alphabetical values. In this, we are going to deal with the questions, in which the numerical code values are assigned to a word or alphabets according to predefined pattern. Candidates are required to identify the numerical pattern of coding so that the given word can be transform in same coding. Example.1. If ‘ACNE’ is coded as 3 7 29 11, then what will be code for ‘BOIL’ in that code language? * This type of coding mainly deals with the mathematical operations. * Operate the question with its alphabetical values.